Here's a true story from last week: A woman was shopping and asked the clerk of a large store where she might find Advent candles. "Where you might find what?" The clerk was confused. "Advent candles. 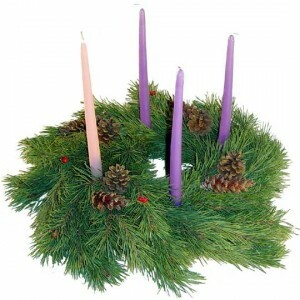 Three purple, one pink, for an Advent wreath." "I'm sorry, ma'am," the clerk replied, "we only sell seasonally appropriate candles." I had similar problems last weekend trying to find Advent candles. After several stores and some phone calls, I gave up looking for purple and pink. But I really needed some color of candles for our Advent wreath -- and not electric ones either. How am I supposed to reflect on the mystery of "light from light" with electric candles? The Creed doesn't make sense with electric candles!And so I settled for the only long candles I could find: red and white. Christmas colors. There will be no penitential purple on our wreath this year. No Gaudete pink. It's just Christmas, Christmas, Christmas, and Christmas.Let us not be fooled by those peddling a "War on Christmas." That's the decoy to divert our attention from the real war going on right underneath our red noses. Everywhere I look or listen, I get Christmas: the colors, the music, the smells, the imagery, even the theological import. Everyone around me knows what Christmas means. Anyone who's heard the four verses of "O Little Town of Bethlehem" has all the Christmas theology they need.The real war is the WAR ON ADVENT! (Yes, I'm shouting, on the off chance that Bill O'Reilly -- four-star propagandist of the decoy war -- might hear me.) People don't even hide the fact that they are trying to eliminate the season of Advent. Everywhere I go, it's "Happy Holidays" and "Merry Christmas." When I try to tell them that "Today is not a holiday" or "Christmas is on December 25" or "I can only assume you're wishing me a prevenient happy Feast of the Immaculate Conception" -- people think I'm playing the Scrooge.I understand that stores are concerned with the bottom line, and that Christmas sells. But we ought to remain vigilant about how the liturgical season of Advent has steadily been replaced with the secular season of Christmas shopping. Then again, maybe American consumerism is just too strong of a force. If only there were a way to combine the season of Advent with our compulsive shopping needs... I know! 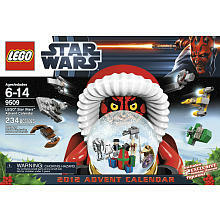 How about a Lego Advent Calendar with a theme of intergalactic warfare! We can turn the war on Advent into 24 days of Star Wars-themed gifts during Advent! Imagine it: each night of Advent, above our deep and dreamless sleep, the silent stars go by, and in that darkness shineth the everlasting light. It's the Death Star exploding! Merry Christmas!